Among the common childhood infections that only occur once in life, measles is among the top three. However, it has been eliminated from the United States due to immunization programs. Yet it still occurs in Americans who are not immunized largely due to infected travelers who bring the virus to the United States. For most people this is not a problem but measles can lead to serious and even life-threatening complications in some instances. Measles is a viral infection which is highly contagious. It is also known as rubeola and should not be confused with rubella (German measles). Although measles is considered to be a childhood infection, it can infect any person of any age. However, since most people have been vaccinated against measles or had measles in childhood, they are unlikely to acquire the infection in adulthood as immunization and a previous infection provides lifelong immunity. The number of new measles cases in the United States sharply declined since the 1960s due to immunization. However, there has been a resurgence in recent decades due to unvaccinated individuals and international travel. There is no treatment to eradicate an existing measles infection. Medical treatment can reduce the severity and duration of the infection and minimize complications. Mealses is caused by a virus. It is a single-stranded RNA virus from the genus Morbillivirus which is within the Paramyxoviridae family of viruses. The virus is spread through secretions like saliva and mucus, particularly by coughing and sneezing. It is highly contagious and the virus is active for up to 2 hours in airborne particles or droplets on surfaces. Close contacts with an infected person are at a high risk of contracting the infection if they have not had measles previously or were not appropriately immunized. Once the virus enters the airways, it starts to replicate within epithelial cells lining the airways such as the trachea and bronchi. After 2 to 4 days the virus then spreads to lymph nodes in the region and thereafter spreads throughout the body. 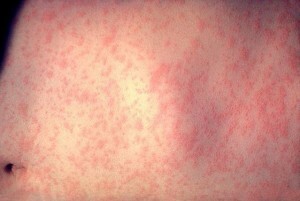 It is only then that a characteristic measles rash is seen. The virus can suppress several mechanisms of the immune system and this can persist for weeks or even months. It therefore also increases the chance of secondary opportunistic infections arising, which may have otherwise been prevented with a healthy immune system. The measles virus can be spread for approximately 8 days, which includes 4 days before the rash appears and 4 days thereafter. The absence of a rash does not mean that a person is not contagious. Therefore it is difficult to look at a person and determine whether they are contagious or not. The signs and symptoms of measles do not appear immediately after the virus infects a person. The incubation period is approximately 10 to 14 days. During this time a person may have no symptoms although they are infected and the virus is replicating within their body. It usually persists for 2 to 4 days but can sometimes occur for up to 7 days. Only thereafter does the measles rash appears. 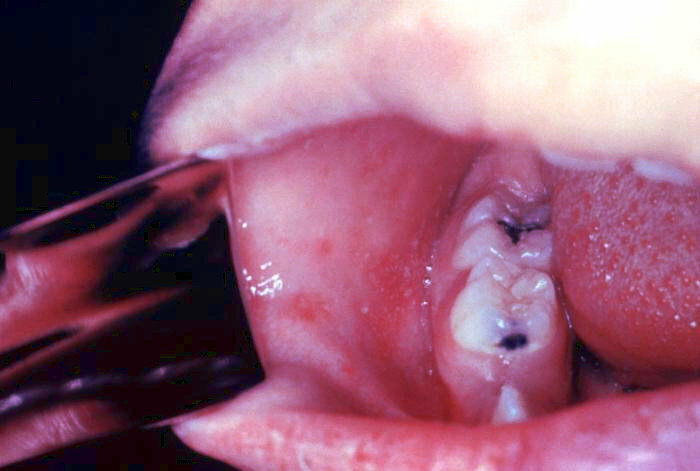 The characteristic measles rash is often preceded by Koplik spots, which are white spots inside the mouth surrounded by redness, and there may also be itching. It can occur for 1 to 2 days prior to the measles rash. Thereafter the measles rash appears with a rise in the fever. It appears as tiny red spots and may occur in clusters. The hairline and face are first affected and over days the rash spreads downwards to the arms, torso, thighs and eventually the lower legs and feet. How long does the measles rash last? The duration of the measles rash can vary from a few days to a week. Usually symptomatic measles, fom the time the first non-specific symptoms arise, resolves within 7 to 10 days if there are no complications. The cough may persist for longer but eventually resolves thereafter. Measles usually does not require any specific medical treatment. The focus is on supportive care such a hydration and bed rest. The infection will resolve on its own within two weeks. Vitamin A supplementation can help reduce the severity of the infection and minimize complications particularly in a person with low levels of vitamin A. Antibiotics do not work for a viral infection but may be prescribed if a person with measles contracts secondary bacterial infections like pneumonia. Medication for a fever, such as acetaminophen or ibuprofen, may also be recommended in cases of a high fever. However, in some cases medical intervention is necessary such as in severe cases of measles, where there is a high risk of complications or a person in significantly immunocompromised (weakened immune system). Immune globulin which helps the immune system fight off the infection is prescribed in these cases. If administered within 6 days of exposure to an infected person, it can help to prevent the infection or at least reduce the severity of measles. Immune globulin is mainly considered for pregnant women, infants or people with a weakened immune system. The only way to prevent measles is to be immunized with the measles vaccine. This vaccination is administered as part of immunization programs in most nations. However, not every person is vaccinated as part of these immunization programs and some people refuse the vaccination due to concerns about side effects. Previous infection provides lifelong immunity. People who are infected should also quarantine themselves so as to avoid infecting others. This does not have to be done within a medical institution but by simply not going out in public while contagious, whether to work, school or a mall. It is also important to not allow others to enter a room or home where a person is in isolation. Close family members and other residents cannot avoid the same living area but others should be discouraged from entering the home or room where an infected person is resting.